Posted on Nov 30, 2011 by Appleton Downtown Inc.
Every Christmas I try to get most of my shopping done in Downtown Appleton, a more relaxed and fun way to shop. I like to find items made by local artists or antiques- each showing true talent and artistry from both the present and the past. 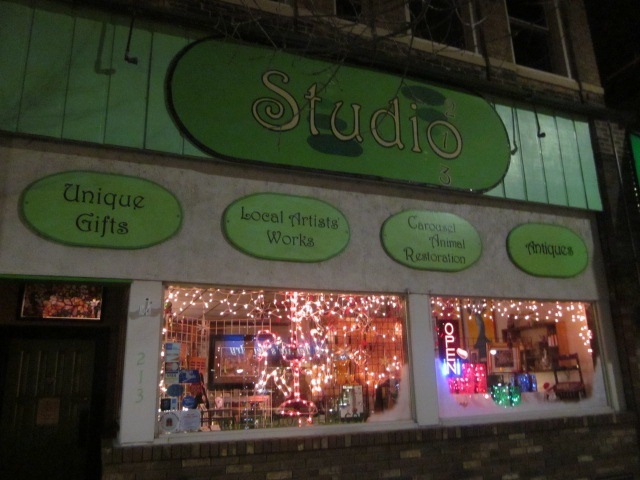 I start shopping at my store, Studio 213 because there are over 50 local artists with everything from pottery,jewelry & hand painted silk scarves for the women to custom cribbage boards, duck calls and fire fighter items for the guys. There are also vintage books and antiques from primitives to hand painted dishes. I then like to check out what tickets are available for the performing arts to have something for the family to enjoy later. After that I check out all the other small business on the Avenue to see what I can find that is unique to their business and perfect for one of my gifts. Overall it makes an enjoyable shopping experience.